Here comes the new official notification from Government Medical Colleges of UK. In this notification they said that they are going to recruit INDIAN candidates for various Assistant Professor posts under various Subjects. So those who have completed their education and looking for professional teaching jobs under Government colleges can apply for this recruitment process. 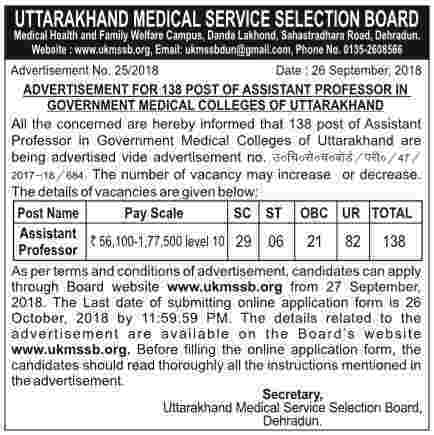 All the concerned are hereby informed that 138 post of Assistant Professor in Government Medical Colleges of Uttarakhand are being advertised vide advertisement no. 2017-18 /684. The number of vacancy may increase or decrease. More information related to these Latest Govt jobs in India is given below in this post. Read it carefully before applying online. Age Bond: Must have age in between 30 years to 45 years for applying these Government jobs in India. How to Apply for these Govt Jobs? 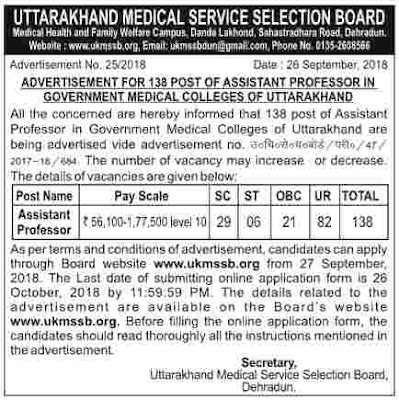 As per terms and conditions of advertisement, candidates can apply through Board website www.ukmssb.org from 27 September, 2018. The Last date of submitting online application form is 26 October, 2018 by 11:59:59 PM. The details related to the advertisement are available on the Board's website www.ukmssb.org. Before filling the online application form, the candidates should read thoroughly all the instructions mentioned in the advertisement. 26th Oct. 2018 is the Last date to Apply. Disclaimer: We took this information from the following website: https://ukmssb.org and sharing with you readers. We also share the Newspaper Screen shot as a official Notice. This notice we took from The Times of India Newspaper.